I actually went out and had fun this weekend! 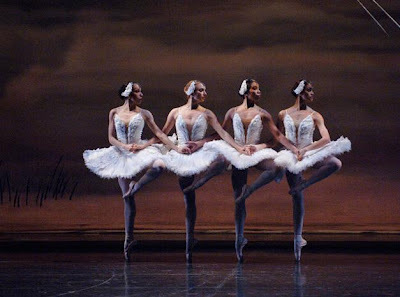 After all the work I have been doing, I finally got a break when I went home for the weekend to see Swan Lake. I haven't been to many ballets (this being my second) but I can officially say I am hooked. I love the combination of grace and delicacy with power and strength. And Swan Lake was absolutely stunning! The costumes and the dancing were just lovely and the orchestra was unbelievably good. The ballet also gave me a chance to wear the dress my grandma gave me. I always thought that she didn't have any old clothes left so I never bothered asking, but we were talking about vintage (which she is shocked to learn I love) and she said she still had a few dresses! 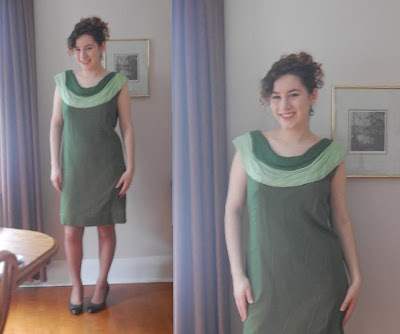 I got two from the 70's (but one looks almost 1920's in style), this lovely green dress from the 50's, and she is also giving me a pair of lounge pajamas after she has them cleaned (she thinks maybe 70's but after looking at the label I would suspect earlier than that). This green dress is my absolute favourite. It is in fairly good condition but the fabric is quite delicate and starting to wear in a few places. I have it carefully wrapped in tissue paper at the moment but I need to come up with another excuse to wear it! (Sorry the picture is a little blurry but my mother has no idea how to use my camera). lol, I loved the swan princess as a kid! i had completely forgotten about it. I live in St Louis and have tons of chances to go to the ballet but we never have! I think I will have to have the husbie take me sometime this year. Gorgeous green dress! !